Lovers, to your left savor the sauciness that is Cheap Monday’s ambrosial Adriana Long Skirt; to the right take a gander at GoJane’s glamorous Sheer Paneled Maxi Skirt. While the gorgeous GoJane gem is ever so slightly longer than the Cheap Monday marvel, harboring a length of 41.5 inches, as opposed to the 39 inches of Adriana; for just $27.60, in comparison to the $85.00 necessary to claim Cheap Monday’s masterpiece as your own, it provides one’s wardrobe with just as much sass as its higher priced pal – without breaking the bank! Thanks to Shopbop and GoJane for the pictures. Don't forget to enter the Let’s Get Ready to Rumba Giveaway for your chance to win a Lafayette Watch in the design of YOUR choice from RumbaTime. I really love the GoJane version, which is a little more opaque. Plus, $27.60 is such a great price. I hope you have a good Tuesday, E.
How cool. Hmmm...I'm short..so I probably wouldn't go with either. But they are very inspiring. So love the new layout and header! Awesome find on the tightwad Tuesday. I really like that Tightwad price! Sooooo chic! Love this and I love the new layout. I'm not so crazy about the sheer! I'll splurge with Cheap Monday. It seems to have more movement to it than the other, it'd be more fun to wear. Eh, I don't like either. But I do love the new look here!! I love the skirt and I ADORE your new layout! Not sure if I'm liking this style at all, so I think I would pass on both options :) Save the money for those Chloe shoes from the other day! I've been a fan of gojane.com for a very long time. I love how inexpensive they are!! I love the Go Jane skirt! Oh the blog is looking great, love! love the sheer skirts! nice blog! Very cute - though I'm not sure if I could pull it off! your page is looking great!!! and i'd totally go for the gojane skirt, i like that it's longer! Why does this totally remind me of hs? I say it doesn't hurt to own both! Perfect combination. This style has become very trendy recently, remember Halle Berry's stunning dress at the Golden Globes this year? We approve at www.anitaabramyan.com! Oh and LOVE the redesign by the way! The new layout looks really good! Maxi's are looking great right now. I can't wait to wear them over the spring. 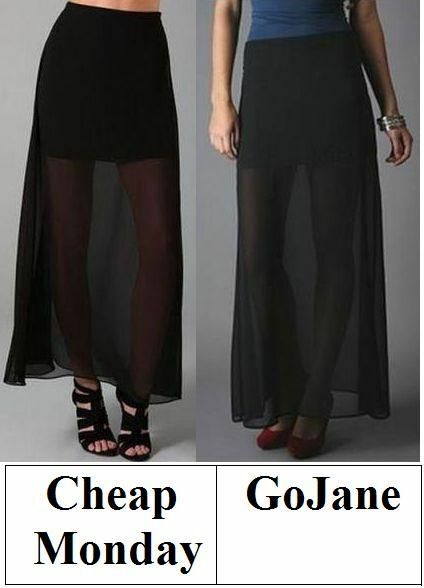 I'm definitely going for the GoJane one. I love your new layout, dear -- absolutely stunning! I JUST bought a black skirt like this at a thrift store for $5! I know total bargain! And can't wait to wear it! I love your blog by the way..
feel free to check out mine. thanks! By the way, I am really liking the new layout! Can I ask how you have set up to have links to your regular features? I hope you had a wonderful, magical Valentine's Day, Erika. You deserve it. I like the GoJane skirt. Also, the new layout is great! Between the two, I love the Cheap Monday version. I don't think I could pull this off, though. Oh- and I'm loving the new blog look! I am in need of a new, long skirt...Thanks for another fab Cheap Monday post! I think I'm going to have to go with the one from Cheap Monday. Fab! I love love love the idea of this skirt. Love the length of the GoJane, but love the sheer of the Cheap Monday. A mix of the two would be nice! btw, nice new blog design! Nice, isn't that similar to what Halle Berry wore at the golden globes? Hmm.. by the way.. lovin your new look! I love your new masthead! It's so fun and fitting. My personal style isn't drawn to sheer clothing, I do like Cheap Monday's hemline more than GoJane. But that could also be because I'm fairly short to begin with. i'm liking the new blog layout luv! and these skirts are both really nice and similar. Its definitely on everyone's list to have this season. So great to see a cheaper version. i would definitely tightwad this because its' so trendy and I wouldn't get too much use out of it! But I do like it, Free People has a take of this and I love it. Page looks good! and actually i can't wear those skirt, because i'm short.. still, they look amazing..
amazing sheer skirt! i have to go with the gojane version. and i love the new layout. Ok this is really cute and so trendy, I really wonder what this would look like on me because I'm so short. I plan on trying some on soon!